The Form 1040-NR is also known as the U.S. Nonresident Alien Income Tax Return and is the tax form you prepare and file if you are a nonresident of the United States. The American tax code is one of the most complicated series of laws on the planet, but every year our country expects anyone who has earned money here to puzzle through its minutia in order to determine how much they owe in taxes. For non-resident aliens, determining their US tax burden can be incredibly complicated. The process starts with filling out the Form 1040-NR, but it can quickly grow into a tax return spanning dozens of pages. Non-resident aliens can generate US-source income from a variety of sources such as through work as an independent contractor and selling and/or receiving dividends from US stocks. Like other US tax forms, the Form 1040-NR is designed to capture all aspects of a filer’s financial life as it relates to reporting income subject to US taxation. 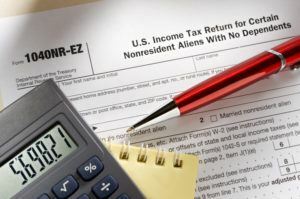 Just like the more widely known Form 1040 filled out by citizens and green card holders, there are several versions the tax form used by a non-resident alien, including a 1040-NR-EZ form designed to simplify the process of determining how much is owed. In order to fill out any of these forms, it’s important to have detailed records of the amount and sources of income, as well as supporting documentation for any deductions and exemptions that you are eligible to claim. You’ll need to provide detailed figures for your US income, including all capital gains from the sale of stock and income earned as an independent contractor or business owner. You will need to file additional forms detailing your financial information for a business, rental income, scholarship or grant money, and many other types of income. Completing the additional forms required to document income is often a challenge, even for people who are very familiar with the tax code. Furthermore, the IRS tends to pay a lot of attention to these pages in a tax filing, due to the fact that a Form 1040-NR is paper filed. That’s why it’s a good idea to hire a professional to complete a non-resident return. The Form 1040-NR is generally considered to be more complex than the standard return for a resident taxpayer. For that reason, individuals and families who need to file these returns may want to look into hiring a tax professional that has extensive experience and knowledge preparing and filing non-resident tax returns. A tax firm, such as Tax Samaritan, will be able to review your situation and determine exactly which forms you need and to prepare and file so that you maintain compliance with your filing requirements. Please click to read more about non-resident tax returns. Foreign Gift Tax – Are Gifts from my Nonresident Alien Parents Taxable?